Derry City midfielder Rory Holden. Derry City manager, Kenny Shiels believes tonight’s game at Shamrock Rovers is the first game in what he has described as a ‘massive month’. 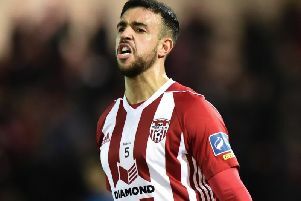 The Candy Stripes face Stephen Bradley’s side in Tallaght this evening, followed by back-to-back games against champions Dundalk in the FAI Cup and league. “The next three or four weeks, in fact August is a pivotal month for a lot of teams,” he stated. City will be without midfielder Nicky Low through suspension, which means that Rory Holden is expected to be in the heart of the midfield. “Nicky being out is a big blow, because he’s sort of pivotal to the way we play, but we have got good players to come in,” he added. “We have got Rory Holden who’s a good player and it’s a great opportunity for him to play at Tallaght and let people see how good he is. “He has got all the qualities to be a top midfield player and we are expecting a lot of big things from Rory and he’s going into the team which should help us. City go into this evening’s clash in good form having won their last three games and they haven’t conceded a goal in any of those wins over Bohemians, Finn Harps and Limerick, much to Shiels’ delight. It’s a great for him (Rory Holden) to play at Tallaght and let people see how good he is. “We are going into the game with good form and I have been pleased with the commitment of the players,” he added. Can you spot yourself in our 2007 Derry clubbing photo gallery?